Skyscrapers not only make a beautiful and impressive skyline, they also provide great opportunities to view the city from high above. However, not all skyscrapers have public viewing platforms or are accessible, and some, like the Sky 100 in ICC charge a lot of money. There are a couple of cheap opportunities to observe the bee hive from above. Photo ID required, Handbags will be x-rayed. The viewing platform is not very spectacular and only 2/3rds up the 70 floor building. It provides the best views of the Mid-Levels district with its modern luxury apartment complexes and of the development area around Tamara/Admiralty and Central. Walter Kwok believes in God. He is one of the inheritors of Sun Hung Kai properties, Hong Kong’s largest real estate developers with over 60 billion HK$ of yearly revenue. Walter Kwok built Sky City church into one of of Sun Hung Kai’s projects to be closer to god. He is also behind “Noah’s Ark” on Tsing Yi, that teaches us about the bible’s version of the origin of life. Everyone is welcome at Sky City Church and the view is amazing. Good views over the industrial harbor and Kennedy Town as well as the Mid-Levels. You’ll also get the chance to learn something about money! Dresscode: Quite flexible, but definitely shoes and long pants for men. There is no cover charge (unless some big DJ is playing), but drinks are as pricey as expected. To get up, enter ICC through Elements on the 9th floor and go up the Ritz Carlton lobby on the 103rd floor. From there it is another elevator ride to the 118th floor. 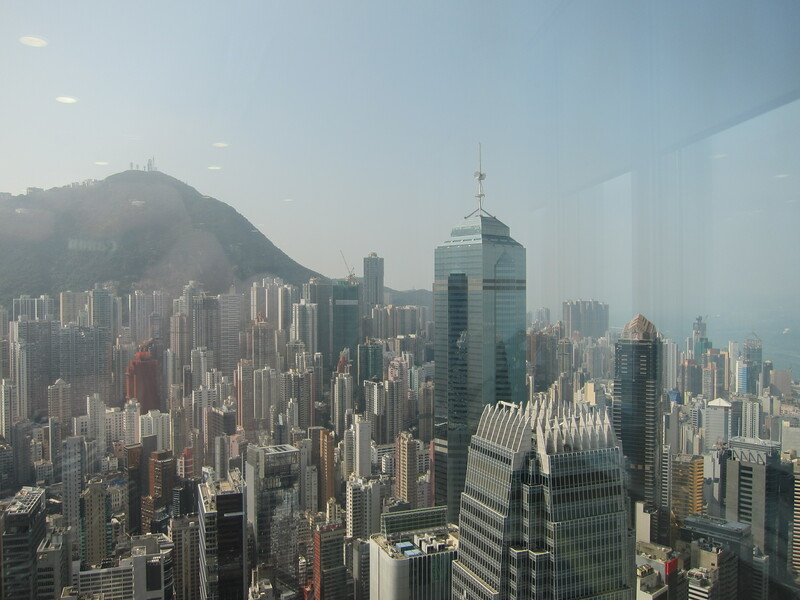 It is therefor 18 floors up from the Sky 100, which charges adults 125 HK$ if they book online. For the same price you already get a pint of Asahi at Ozone, but to be fair, Sky 100 has cleaner windows and the 360° view. Ozone only fills up with jet-lagged consultants and exes at around 10pm, so don’t worry about a window seat. It also has a windy outside section, where you will have just the sky above you. 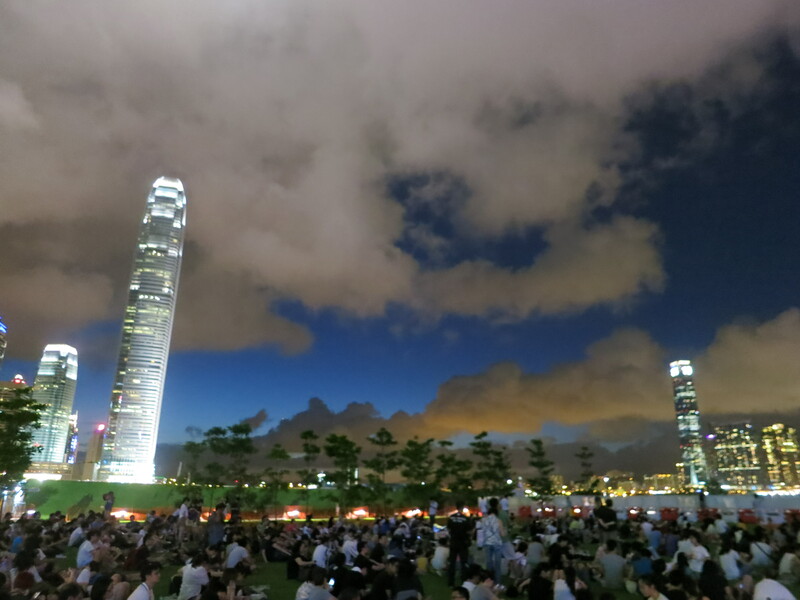 It is not as much fun as it sounds to see the light show from up there, as Hong Kong’s sky is usually so polluted and foggy that ICC is too high up to enjoy it. You’ll be literally scraping the sky. ICC and IFC form an impressive gateway into Hong Kong. First of all, Megabox is a great mall. Especially architecturally speaking. It features four distinct areas that are connected by express elevators. Downstairs it looks like a random mall, with Manning’s, McDonald’s and Hang Seng Bank taking up most of the space. Going up on the first express elevator you will pass Ikea and department stores. Going up the next two express escalators, you will pass through a large atrium with various small stores and arrive at Hong Kong’s largest ice skating ring and various acceptably priced dining options. Just behind the ice skating ring is a great observation platform from where you get a good overview of what the old Kai Tak used to be. You will also get a good overview of the development process of the area and a good view over North Point. The downside of Megabox is its inconvenient location. It is about 10 minutes walking away from 九龍灣 Kowloon Bay Station. There is a free shuttle bus between the MTR station and Megabox, but expect to queue. There are also great Red Minibus options for Mong Kok, look out between Exchange Tower and Enterprise Square III! Alright, this is not exactly encouraged by your government or privacy advocate, but most of old Mong Kok rooftop buildings have accessible rooftops that you can climb up for a great view over the city’s most vibrant district. Although Bauhaus was never too popular in Hong Kong, the style and the philosophy did influence local architecture. Bauhaus, being designed for cheap and stylish housing for the working class often incorporates ideas of collectivism by allocating communal space. In Tel Aviv and Hong Kong that is usually the roof top. Nowadays however these roof tops are rented out illegally to extent living space, and you might get stares and confronted when walking onto a roof top that is used as a home. 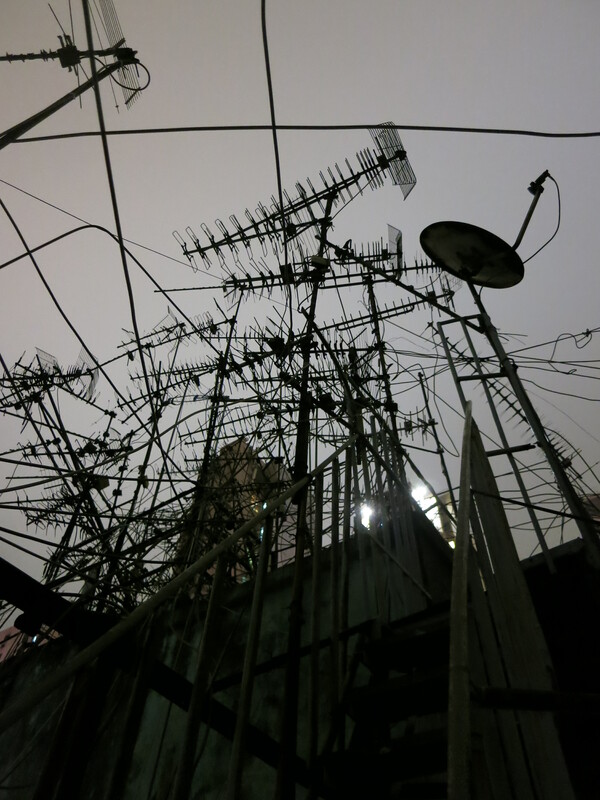 An array of antennas on one of Mong Kok’s many accessible roof tops.